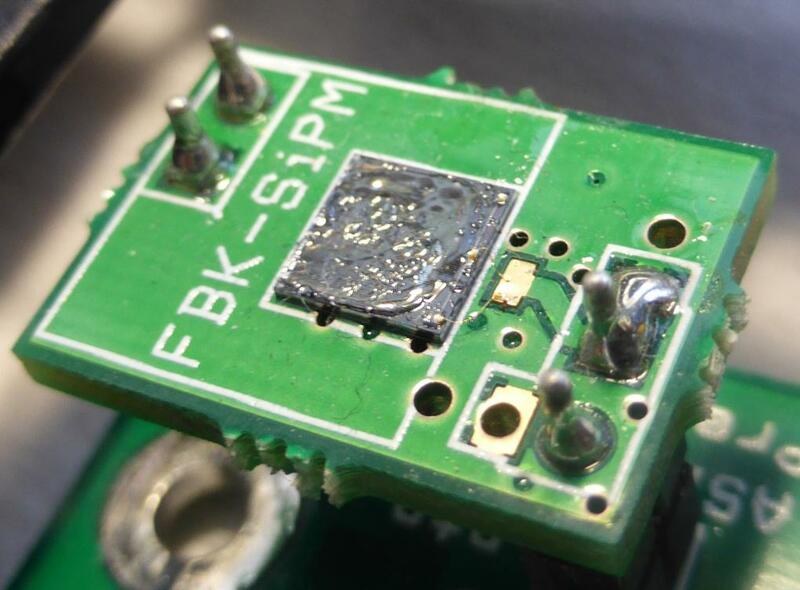 The silicon photomultiplier (SiPM) is a radiation detector with extremely high sensitivity, high efficiency, and very low time jitter. It is based on reversed biased p/n diodes, it can directly detect light from near ultra violet to near infrared, and it is employed in all those applications where low light/radiation level must be measured and quantified with high precision. A SiPM consists of a matrix of small-sized sensitive elements called micro-cells (or pixels) all connected in parallel. 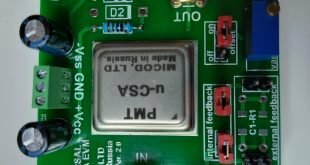 Each micro-cell is a Geiger-Mode avalanche photo-diode (GM-APD) working beyond the breakdown voltage (Vbd) and it integrates a resistor for passive quenching. A Geiger-Mode avalanche photo-diode is an avalanche diode biased beyond the breakdown voltage. In this way in the depleted area, there is a strong electric field enough to give a single electron the energy enough to trigger the ionization process by means of multiple collisions in an avalanche process. In the image above is shown the trend of the current and voltage for a pulse produced by a SiPM. The rising edge is very fast, on the order of 10ns. The falling edge depends on the capacity of the junction and the resistance of quenching, and that is in the order of 100ns. The SiPM has to be biased with a voltage Vbias greater than the voltage Vbd (Breakdown voltage). The value of the “overvoltage” ranges from 2 to 4 V. The Vbd has a value of about 28V, it follows that the bias voltage has a value ranging from 28V to 32V. The SiPM have a significant noise, called “dark current”. 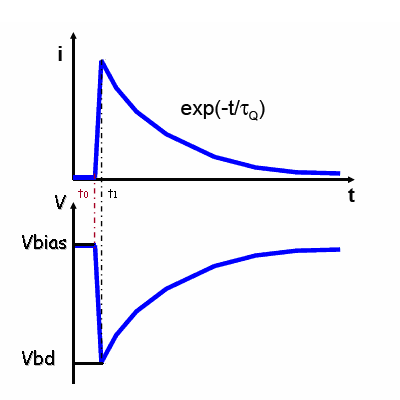 The phenomenon of dark current is explained by the spontaneous generation, by thermal effect, of electron-hole pairs in the depleted region. This is due to the presence of centers of generation-recombination that have an energy level place approximately in the middle gap between the valence band and the conduction band. The presence of recombination centers arises from imperfections in the crystal lattice that introduce energy levels within the gap. The crystal LYSO and the SiPM are coupled as shown in the first image to the left, using an “optical glue” to stick the crystal to the surface of the sensor. In the picture you cannot see, but the crystal LYSO was wrapped with white Teflon tape in order to increase the reflectivity and thus efficiency. SiPM and LYSO were then inserted into a plastic tube covered with tape and aluminum tape, so as to ensure the seal to light. Inside the plastic tube some foam has been inserted in order to keep the crystal in position on the front window and protect the sensor from accidental impact. The signal produced by SiPM is very short and small scale (50-100mV). To be acquired by an MCA system it must be properly shaped and subsequently amplified. The first stage of the SiPM adapter is constituted by the bias and pulse extraction circuit. The load resistance R1 is set to Vbias, while the anode of the SiPM is connected to ground, this allows to obtain negative pulses, so that, after the reversal produced by the amplification stage, they turn positive to be sent to the MCA system. 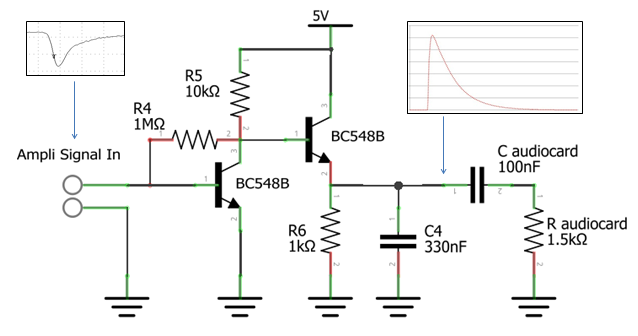 The two low-pass cells R2C2 and R3C3 are intended to lengthen pulse until 100-200 μsec and round off the tip so that during the subsequent sampling of the ADC is easier to determine the peak value of the pulse. 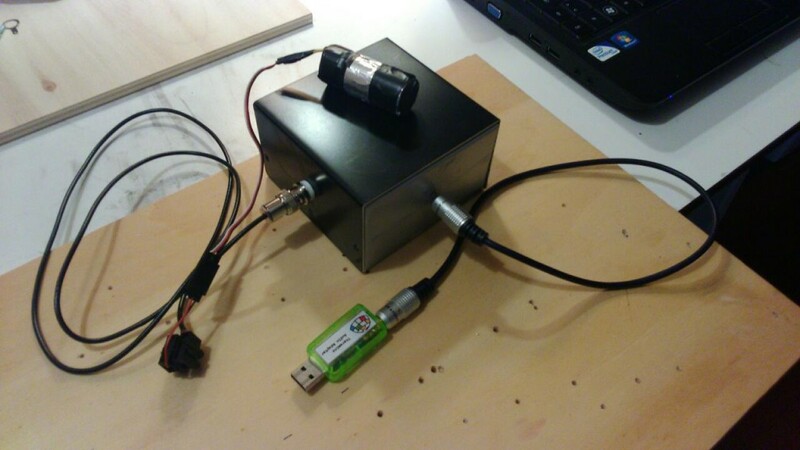 However, after the “shaper”, the pulse has very low amplitude thus an amplifier stage is needed. Vbias : increasing Vbias (28-32V) also increases the amplitude of the output signal. From tests carried out it has been seen that, for a value of around 30V the best results in terms of energy resolution are obtained. R1 : this resistor converts the current pulse in a voltage pulse. Setting it too high could drive the amplification chain in saturation. Low values (50ohm) allow us to obtain very short pulse durations. In our case it is convenient to raise R1 just to stretch the pulse. C2, C3 : increasing the value of these capacitors the amplitude of the signal falls and the duration increases. R5 : the value of this resistor determines the gain of the amplification stage. The values of the components present in the schemes allow to have an energy range more or less corresponding to real values. For calibration, you may want to vary the voltage Vbias within the range 29-31V, while fine tuning is done within the MCA system. Particular care should be made in the control of noise / ripple present in the power voltage of the shaper (30V) and the amplifier (5V). For good results the final noise should not be higher than 1mv. Batteries could also be used to get the required voltages.